The Edelweiss Pirates were a loosely organised and related set of youth groups who resisted the Nazi state. Edelweiss Pirates tended to be aged 14-17. They shunned organised Hitler Youth activities. Edelweiss Pirates expressed themselves, initially, through defying restrictions. Later, many Edelweiss Pirates were involved in activities that were considered to be subversion during the war. Unlike some of the other resistance movements, there was no recognisable link between Edelweiss Pirates in different regions of Germany. Whereas the church, the army and ‘grown up’ groups could travel, share ideas and utilise contacts, these youth organisations had not established these links, nor had the resources to make them. Groups sprang up after membership of the Hitler Youth became compulsory in 1936. At 14, youngsters could leave school. At 17, they were conscripted. This age gap provided an opportunity to express themselves and be free from the regimented control of the Nazi machine. Prior to the war the Edelweiss Pirates tended to ‘resist’ through simply expressing themselves. They would go on hikes, camping expeditions etc. The groups, unlike the Hitler Youth, were open to both boys and girls. They would socialise together, listen to foreign radio stations and sing songs that were banned by the Third Reich. This was essentially a teenage rebellion, which many youngsters have against ‘the rules’ in whatever society they are in. The outbreak of war saw a change in the way that some of these groups organised themselves. Restrictions on movement were far greater. Prior to the war the activities of these groups had not posed any great threat. These were youngsters letting off steam and whilst annoying to the state, it was hardly open or widespread resistance – at least not resistance that was of any great concern to the state. Wartime restrictions made the life of an adolescent harder. The few freedoms that had existed were taken away. The prospects, for those who wanted freedom and some fun, seemed bleak. This led to more proactive forms of resistance and saw some Edelweiss Pirate groups move into areas more commonly associated with open resistance and opposition. Note – in many cases there is little evidence available to show that it was or wasn’t the Edelweiss Pirates who were responsible for the above. It is probable that they were responsible for many actions, though the exact scale of their involvement is hard to gauge as they were also an easy group for the regime to blame. 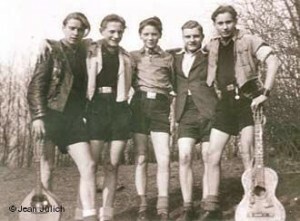 Over the course of the period 1936 to 1945 the regimes attitude towards youth organisations such as the Edelweiss Pirates changed. At first punishments were, relatively speaking, quite light when compared to those given to adults. The Edelweiss Pirates were rebelling against the authoritative state and it’s image. Punishments were therefore given out that made them comply: shaving hair so that it looked like a military haircut, weekend imprisonment etc. As the war progressed and it became clear that youngsters were involved in activities such as those listed above, the punishments became more severe. As with the adult population, there were a considerable number of arrests. Himmler is reputed to have recommended 2 to 3 years in a Concentration camp for any youth who did not comply totally. This anger at the non conformist approach of the Edelweiss Pirates led to executions of youth group leaders. The most famous of these executions was the public hanging, in Cologne, of 13 youngsters: of whom we know 6 had been active members of the local Edelweiss Pirates group.